Purpose: To conduct a systematic review of randomised controlled trials (RCTs) evaluating the effect of surgical and non-surgical procedures on the acceleration of orthodontic tooth movement (OTM) as an adjunct to orthodontic therapy (OT) in order to estimate the efficacy of these procedures and the benefit of their use in everyday orthodontic practice. Materials and methods: Literature search was performed on PubMed, Scopus, Web of Science and Cochrane databases up to July 2014. Inclusion criteria were: (1) RCTs; (2) orthodontic therapy on permanent dentition; (3) application of adjunctive surgical or non-surgical procedures for accelerating OTM; (4) measurement of tooth movement. The primary outcome measure was tooth movement expressed as cumulative tooth movement (CTM), rate of tooth movement (RTM) or time of tooth movement (TTM). Pain and discomfort, periodontal health, anchorage loss, bone and root changes, and undesired tooth movement were evaluated as secondary outcomes. Results: Literature research identified 184 studies. After screening of titles, abstracts and full-text studies, fifteen fulfilled the inclusion criteria and were included in this review. Six of the included studies investigated the effect of corticotomies, one of interseptal bone reduction, four of lowlevel laser therapy (LLLT), three of intraoral/extraoral devices releasing extracorporeal shock waves (ESWT), pulsed electromagnetic field (PEMF) and electrical current, respectively, and one of injected substances (relaxin) as an adjunct to OT. Three studies resulted of high methodological quality, six of medium, and six of low quality. Interseptal bone reduction was reported to increase RTM during the first 2 months (P = 0.002) and CTM at 3 months (P = 0.003). Studies investigating corticotomy reported significantly increased RTM (up to 2.3 times) during the first months after intervention, whereas results on TTM and CTM were quite controversial ranging from non-significant to highly significant (up to three times of TTM increase). The heterogeneity between studies investigating corticotomy could not allow for quantitative synthesis of the findings. Out of four studies investigating LLLT three reported positive effect on OT. Due to inadequate statistical analysis of data from original articles, results could not be summarised in meta-analyses. Effects of both electrical current devices and PEMF devices on CTM were reported to be larger on the experimental sides than on the control sides (P < 0.001). The other interventions were reported to be of no statistical or clinical relevance. Conclusions: In the short term, corticotomy can accelerate OTM whereas long-term effects are questionable, thus no firm conclusions can be made on its efficacy and benefit of clinical use. There is some evidence that LLLT can slightly accelerate OTM but this result is not significant and the effect estimated is not clinically relevant. The very limited research-based evidence suggesting beneficial effects of interseptal bone reduction, electrical current and PEMF on OTM does not allow for solid conclusions. More high quality clinical research is required in order to estimate the efficacy of adjunctive interventions on accelerating OTM and their potential clinical use. Purpose: To compare the outcome of cross-arch prostheses supported either by supershort (5 mm) or long (11.5 mm) implants, placed flapless and immediately restored with metal-resin screw-retained cross-arch prostheses. Materials and methods: Thirty patients with edentulous (or to be rendered edentulous) mandibles and 30 with edentulous maxillas, who had sufficient bone to allow the placement of four and six implants respectively, which were at least 11.5 mm-long, were randomised according to a parallel group design into 2 equal groups, where they received either 5 mm or 11.5 mm-long implants at one centre. Implants with a diameter of 5 mm, were to be placed flapless with an insertion torque of at least 50 Ncm. Mandibles received four implants between the mental foramina. Implants were to be immediately loaded with metal-resin-definitive prostheses on the same day of implant placement. Patients were followed up to 1 year after loading and the outcome measures were: prosthesis and implant failures, complications, and peri-implant marginal bone level changes. Results: No patients dropped-out. Two prostheses were remade, one on short maxillary implants and one on long mandibular implants. Two 5 mm maxillary implants which did not achieve 50 Ncm torque in soft bone of one patient, but were immediately loaded anyway, failed after 3 weeks compared to one mandibular 11.5 mm-long implant that failed after 60 days. Two complications occurred in each group. There were no statistically significant differences for prosthesis failures, implant failures and complications. Patients with mandibular short implants lost on average 0.08 mm of peri-implant bone at 1 year and patients with long mandibular implants lost 0.51 mm. Patients with short maxillary implants lost on average 0.15 mm of peri-implant bone at 1 year and patients with long maxillary implants lost 0.62 mm. Short implants showed less bone loss when compared to long implants and the differences up to 1 year were statistically significant both in maxillae (mean difference = 0.48 mm, 95% CI 0.22 to 0.73, P = 0.0011) and in mandibles (mean difference = 0.44 mm, 95% CI 0.21 to 0.66, P = 0.0009). Conclusions: Flapless-placed 5 mm-long implants achieved similar results as 11.5 mm-long implants when supporting immediately loaded cross-arch prostheses both in maxillae and mandibles up to 1 year after loading. These preliminary results must be confirmed by other trials, and 5- to 10-year post-loading data is necessary before making reliable recommendations. Meloni, Silvio Mario / Tallarico, Marco / Lolli, Francesco Maria / Deledda, Alessandro / Pisano, Milena / Jovanovic, Sascha A. Purpose: To compare epithelial connective tissue graft vs porcine collagen matrix for sealing postextraction sockets grafted with deproteinised bovine bone. Materials and methods: A total of 30 patients, who needed a maxillary tooth to be extracted between their premolars and required a delayed, fixed, single implant-supported restoration, had their teeth atraumatically extracted and their sockets grafted with deproteinised bovine bone. Patients were randomised according to a parallel group design into two arms: socket sealing with epithelial connective tissue graft (group A) vs porcine collagen matrix (group B). Outcome measures were: implant success and survival rate, complications, horizontal and vertical alveolar bone dimensional changes measured on Cone Beam computed tomography (CBCT) scans at three levels localised 1, 3, and 5 mm below the most coronal aspect of the bone crest (levels A, B, and C); and between the palatal and buccal wall peaks (level D); and peri-implant marginal bone level changes measured on periapical radiographs. Results: 15 patients were randomised to group A and 15 to group B. No patients dropped out. No failed implants or complications were reported 1 year after implant placement. Five months after tooth extraction there were no statistically significant differences between the 2 groups for both horizontal and vertical alveolar bone dimensional changes. At level A the difference was 0.13 ± 0.18; 95% CI 0.04 to 0.26 mm (P = 0.34), at level B it was 0.08 ± 0.23; 95% CI -0.14 to 0.14 (P = 0.61), at level C it was 0.05 ± 0.25; 95% CI -0.01 to 0.31 mm (P = 0.55) and at level D it was 0.13 ± 0.27; 95% CI -0.02 to 0.32 mm (P = 0.67). One year after implant placement there were no statistically significant differences between the 2 groups for peri-implant marginal bone level changes (difference: 0.07 ± 0.11 mm; 95% CI -0.02 to 0.16; P = 0.41). Conclusions: When teeth extractions were performed atraumatically and sockets were filled with deproteinised bovine bone, sealing the socket with a porcine collagen matrix or a epithelial connective tissue graft showed similar outcomes. The use of porcine collagen matrix allowed simplification of treatment because no palatal donor site was involved. Pozzi, Alessandro / Tallarico, Marco / Moy, Peter K.
Purpose: To evaluate the clinical and radiological performance of an immediately loaded novel implant design over a 3-year period. Materials and methods: This prospective study includes 54 consecutive partially edentulous patients treated between December 2010 and October 2011. Outcome measures were: implant and prosthetic failures; biological and mechanical complications; marginal bone loss (MBL); sulcus bleeding index (SBI); and plaque score (PS). Results: A total of 118 (29 narrow platform, 70 regular platform and 19 wide platform) NobelReplace Conical Connection implants were placed in both post-extraction sockets and healed sites and immediately loaded. The mean insertion torque was 63.4 ± 7.1 Ncm. One hundred out of 118 implants (84.7%) were inserted with a torque ranging between 55 and 70 Ncm. Each patient received a single prosthesis. At the 3-year follow-up, no patient dropped out and only two post-extractive implants failed (1.7%) in two patients (3.7%). The only complication (1.9%) observed was an event of periimplantitis, consisting of a mean mesiodistal peri-implant bone loss of 3.2 mm reported in a healed site of a smoker patient at the 2-year follow-up examination. No prosthesis failures were detected. The cumulative mean MBL between implant placements at the 3-year follow-up was 0.68 mm (95% CI: 0.44, 0.92). At the 3-year follow-up session, the SBI and PS were 5.7% and 15.4%, respectively. 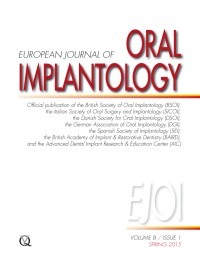 Conclusions: The NobelReplace Conical Connection implant can be considered as a valuable treatment option for immediate implant placement and loading in the partially edentulous patients over a 3-year period. Insertion torques ranging between 55 and 70 Ncm are not detrimental to osseointegration. Purpose: This single-arm study to compare the gingival with peri-implant mucosal inflammatory response to a mechanical supragingival-supramucosal biofilm control program. Materials and methods: Twenty-two participants (55.7 ± 11.2 years) with both gingivitis and periimplant mucositis were examined at days 0, 30 and 390 (full mouth/6 sites per tooth/implant [TTH/IMPL]) for visible plaque (VPI), gingival bleeding (GBI), modified plaque (mPlI) and bleeding indexes (mBI), probing depth (PD) and bleeding on probing (BOP). The biofilm control was carried out weekly in the first month and every 3 months thereafter. An intention-to-treat analysis was performed (drop-out rate = 8) and linear models were used against comparisons in order to look at the clustering of TTH/IMPL by each individual. Results: VPI/mPlI and GBI/mBI reduced from day 0 onwards. Intra-group reductions (P < 0.05) were observed at day 30. PD values (in mm) were higher (P < 0.001) for IMPL than for TTH [mean difference (95% CI) at day 0: -1.10 (-1.58 to -0.63); day 30: -0.88 (-1.28 to -0.48); and day 390: -0.60 (-0.84 to -0.33)], where both groups showed reductions (P < 0.05) throughout the study. BOP was greater (P = 0.00001) for IMPL at baseline [mean difference (95% CI): -0.24 (-0.31 to -0.17)] but reduced (P = 0.00001) and showed similar levels to TTH from day 30 onwards. With regard to sites with the greatest PD, BOP reduced (P < 0.05) in both IMPL and TTH, with greater PD reductions observed for IMPL (P = 0.00001). Conclusions: The supragingival-supramucosal biofilm control benefited both teeth and implants. Purpose: To evaluate the prevalence of peri-implant diseases in a university patient sample and to analyse possible risk variables associated with their occurrence. Materials and methods: One hundred and eighty-six patients with 597 implants were examined clinically and radiographically. The mean period of function was 5.5 years (range 1 to 16.5 years). A subgroup analysis was performed for implants with a minimum function time of 5 years. Outcome measures were implant failures, prevalence and risk indicators of peri-implant diseases. In order to identify statistically significant risk indicators of peri-implant mucositis and peri-implantitis multi-level logistic regression models were constructed. Results: The prevalence of peri-implantitis and peri-implant mucositis on patient levels were 12.9% (13.3% for ≥ 5 years) and 64.5% (64.4% for ≥ 5 years), respectively. Multi-level analysis showed that a high plaque score (OR = 1.365; 95% CI: 1.18 to 1.57, P < 0.001) was a risk indicator for periimplant mucositis, while augmentation of the hard or soft tissue at implant sites had a protective effect (OR = 0.878 95% CI: 0.79 to 0.97, P = 0.01). It was also shown that the odds ratio for having peri-implant mucositis increased with the increase of plaque score in a dose-dependent manner. With respect to peri-implantitis, loss of the last tooth due to periodontitis (OR = 1.063; 95% CI: 1.00 to 1.12, P = 0.03) and location of the implants in the maxilla (OR = 1.052, 95% CI: 1.00 to 1.09, P = 0.02) were identified as statistically significant risk indicators. Conclusions: Within the limitations of this study, the history of periodontal disease was the most significant risk indicator for peri-implantitis and the level of oral hygiene was significantly associated with peri-implant mucositis.